Historically, casinos have been eager adopters of technologies that help them to gather knowledge about their customers. 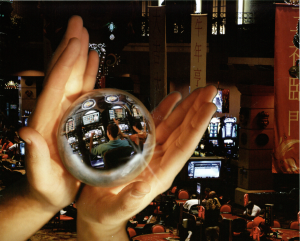 The knowledge-gathering repertoire of the modern casino has shifted from telephone surveys, focus groups, and rudimentary datasets to complex feats of reconnaissance and analysis enabled by player tracking systems, data visualization tools, and behavioral intelligence software suites. Many surveillance techniques first applied in casinos were only later adapted to other domains—airports, financial trading floors, shopping malls, banks, and government agencies. “Knowledge is power and perhaps nowhere is this more evident than in the gaming industry,” observed a trade journalist in 1999, before Internet corporations like Google, Amazon, and Facebook had become famous for their innovations in consumer monitoring and marketing (Parets 1999:19). “The unique advantage of our industry,” notes gambling executive Lars Klander of TechResults, “is that we have hundreds of touch points a week or month, thousands per year, so you’ve got a profuseness of data that you don’t have in other areas.” Out of this data casinos draw the contours of customer groups that we might think of as “touch-point collectives.” An examination of the ways that casinos detect, intervene in, and shape these groups offers insight into the workings of such collectives in other contemporary domains. Nearly 70 percent of casino patrons in the United States participate in so-called loyalty programs, using player cards to gamble rather than coins, paper money, or tickets. While their participation grants them redeemable points based on the volume of their play, it grants casinos a wealth of information. Casino player tracking systems, inspired by airline and credit card reward programs in the mid-1980s, record the value of each bet gamblers make, their wins and losses, the rate at which they push slot machine buttons, and what drinks and meals they purchase. Tracked gamblers are treated less as individual subjects than as “dividuals” in the Deleuzian sense—collections of traits, habits, and preferences that casinos can systematically compare to those of others in order to identify distinct customer niches (Deleuze 1992; Andrejevic 2007). Harrah’s, a franchise that tracks players seamlessly from coast to coast by pooling information from its national chain of properties into a single centralized database, parses its market into ninety different segments and addresses each with a unique marketing scheme. 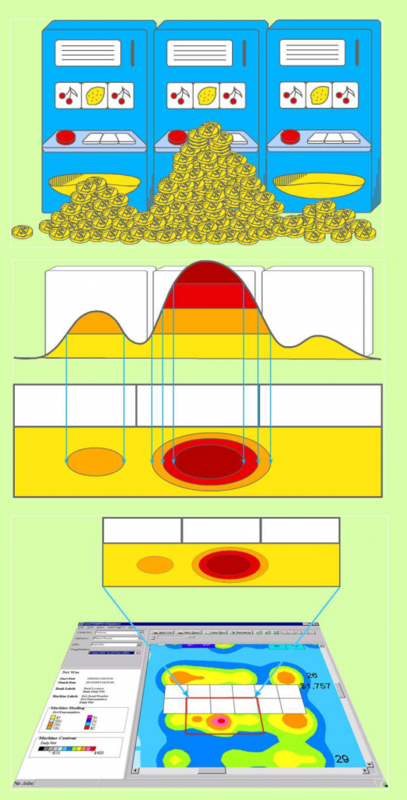 In the past, strategic adjustments to casino layouts, game selections, or marketing campaigns were based either on trial and error or on projective modeling techniques such as “stochastic migration,” in which theoretical individuals created from samplings of actual behavior (typically recorded by note-taking observers) were followed through virtual simulations of an environment before and after a proposed design change—moving a bank of machines a few feet left, for instance, or widening the entryway to a gaming area. While the challenge for such techniques was to gather enough of the right information on existing customer behavior to forecast the effects of a particular change, the challenge for tracking techniques is different: How to extract meaningful insight from a continuous stream of “live data” that is overwhelming in its volume and detail? “We’ve got 20,000 [behavioral] models per second, streaming off the floor,” remarks Javier Saenz, vice president of network systems at IGT. The challenge has given rise to behavioral intelligence software suites like Compudigm’s seePOWER, a technology that promises to help casinos cope with “atomic level data across the enterprise in real time.” SeePOWER transforms massive amounts of touch-point data into colorful heat maps that represent collective “tendencies and preferences” in and over time, as a company press release puts it. A representative gave a demonstration of the software’s abilities on her laptop computer during the 2007 Global Gaming Expo in Las Vegas. She pulled up a map titled “Time Played—Females,” picturing data for women players on one casino slot floor over a twenty-four-hour period. Dark red clots of color appeared around the machines they had played the longest, encircled by bands of progressively “cooler” shades around those they had played less—magenta for sixteen hours, pink for twelve hours, and so on (See Animation). In a time-lapse animation, these shaded contours undulated as gambling activity waxed and waned at different machines. Animation of the casino floor with seePOWER software. An animation of the same area over five consecutive days revealed a curious pattern. Every evening at the same time, female patrons under thirty were moving from one side of a popular bank of slot machines to the other, while males over fifty were taking their original seats. Upon further investigation it was discovered that the men were exiting a nearby showroom at the close of a revue performance and pestering the young women. Casino managers responded by creating “a whole new protective area for those women” containing the machines they liked to play, and sent out a direct mailing to promote the new slot shelter. Previous profit levels not only returned but were quickly surpassed. The casino’s data cloud, when animated and queried, had rendered visible the fleeting, real-time contours of a behavioral group whose constituents, seated at individual play terminals and immersed in the solitary activity of play, were likely unaware of their kinship. Casino managers attempted to profit from the proclivities of this touch-point collective by carving out a physical space for its members and formally inviting them to gather there—not to socialize, but to continue to interact with their own game screens. Although the players were affiliated by age, gender, game preference, and ultimately a common gathering site, the collective they formed was “virtual” in the sense that it took shape and subsequently became meaningful through casino data analysis and visualization software rather than through self-selection, voluntary participation, or shared experience. The collective-making abilities of Compudigm’s software extend beyond the physical confines of the casino, generating “outside maps” that complement “inside maps” by further illuminating the behavior of particular groups. “Let’s say we want to see the profitability of females fifty-five and older. Who are these ladies? Where do they live? How can we target them better?” The representative showed an animated map of an unidentified city, titled “ground floor, little old ladies, carded play time.” As the clock in the upper left-hand corner spun, the city flared and pulsed with color, registering the home addresses of older women gamblers as they began and ended sessions of machine play on the ground floor of one casino over the course of a day. In the wee hours, small circles of color dotted the landscape, with red centers indicating the neighborhoods most heavily populated by current onsite players. Starting at 8 a.m., the center of the map dramatically blossomed outward into a bright red flower, reaching maximum size at 11 a.m. and shrinking back in the evening; across the city, discrete pockets of “little old ladies” continued to gamble throughout the night. Armed with this knowledge, the casino was in a position to tailor its offerings to the play schedules and affinities of the market segment in question. Ground floor, little old ladies carded time played AVI. Complementing seePOWER’s ability to detect and track the habits of particular behavioral collectives through time is its capacity to comparatively visualize the respective profitability of diverse demographic segments. The company spokesperson presented one such map in which cumulative levels of spending for different slot types appeared as color-coded circles (red for high spending, shades of orange and gold for moderate, green and blue for low). 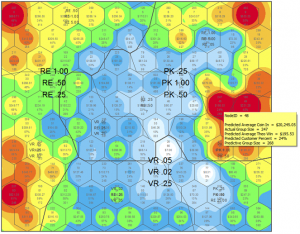 Over these ponds of color a neat honeycomb lattice was superimposed, each of its hexagons containing labels for the group characteristics corresponding to the spending intensities beneath (e.g. “middle income, ethnically diverse,” “retired, single income,” and the like) (See Illustration). 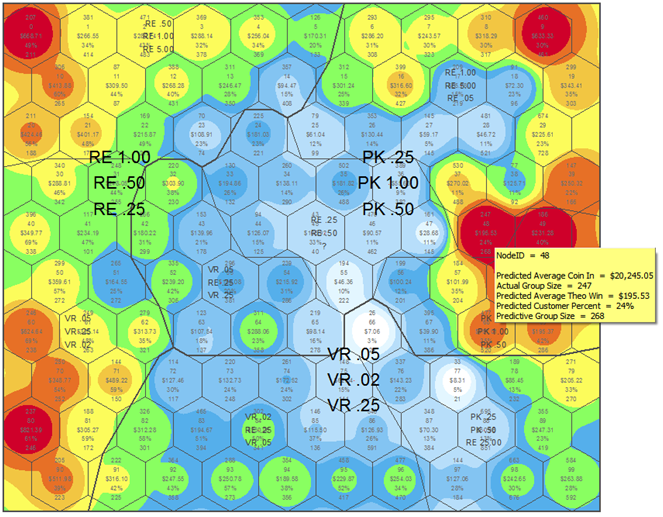 The map’s colorful profitability contours, overlaid with the geometric grid of market segmentation, were presented as a visual tool for revealing hidden group likenesses and distinctions that could guide casino managers’ marketing interventions. As in the case of online venues like Amazon.com, individuals’ consumer behavior in casinos, recorded in a common data cloud and refracted through statistical analysis, becomes the basis for group classifications of which they may not be aware but in which they continue to participate—sometimes more robustly as a result of the customized product marketing that follows. The contours of touch-point collectives are honed through an iterative process of data differentiation and marketing response that tends toward a telescoping of group tastes. Server-based gaming, in which game content can be instantly downloaded from an online server or “jukebox,” is an example of a marketing response that promotes this kind of telescoping. 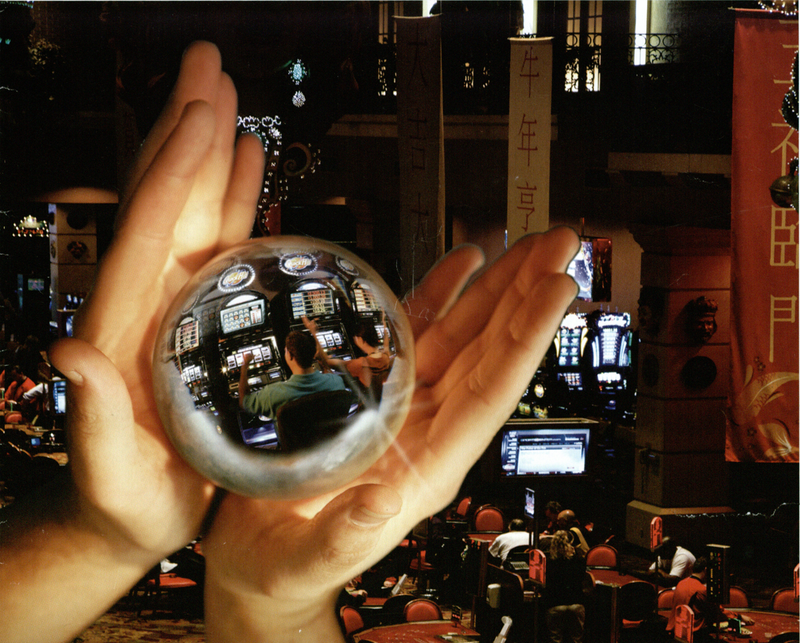 On the one hand, the technology allows casinos to anticipate the tastes of predefined cultural, ethnic, and demographic groups; game screen font sizes, for instance, can be increased in anticipation of the arrival of elderly patrons, while slot machines can be virtually “reskinned” for special events like Cinco de Mayo or Chinese New Year (Macomber and Student 2007: 28). On the other hand, it allows casinos to flexibly react to unanticipated preference groups in real time, switching out game configurations (i.e theme, denomination, payout rate) to match player predilections as they emerge and shift. As tracked touch-point data is continuously uploaded to the casino’s data cloud and analyzed in the aggregate for collective patterns, digital game content is continuously downloaded from the game cloud such that the casino becomes “dynamically responsive” to the affective and behavioral contingencies of its player markets (Green 2007:34). Knowledge and intervention are intimately linked in the creation of touch-point collectives. Casinos used biometric systems, for instance, well ahead of law-enforcement agencies, airport security, and businesses (Schwartz 2003: 216–17). They also used non-obvious relationship awareness (NORA) software used to discover cheating collusion in casinos before it was adopted by Homeland Security to investigate connections between terrorist suspects (see Kaplan 2010). Yet the exchange goes both ways: emerging systems of server-based gambling, for instance, adopt the same cryptography system as the government’s National Security Agency. Harrah’s Total Rewards website. The Total Rewards program began as Total Gold in 1998 and changed names in 2000 with the addition of “player tiers.” By 2004, 30 million cardholders were signed up in the program, and today the number stands at 40 million. This piece draws on a chapter of the book, Addiction by Design: Machine Gambling in Las Vegas, 2012, Princeton University Press. Andrejevic, Mark. 2007. iSpy: Surveillance and Power in the Interactive Era. Lawrence: University Press of Kansas. Deleuze, Gilles. 1992. “Postscript on the Society of Control.” October 59: 3–8. Green, Marian. 2007. “Station Casinos Carefully Rolls Out Guaranteed Play Option to Video Poker Crowd.” Slot Manager, November/December. Kaplan, Michael. 2010. “How Vegas Security Drives Surveillance Tech Everywhere.” Popular Mechanics, January 1. Available at link. Macomber, Dean, and R. Student. 2007. “Floor of the Future I.” Global Gaming Business 6 (11). Parets, Robyn Taylor. 1999. “Advances in Linked Gaming Technology.” International Gaming and Wagering Business (Special Issue for World Gaming Congress and Expo), September: 19-20. Schwartz, David G. 2003. Suburban Xanadu: The Casino Resort on the Las Vegas Strip and Beyond. New York: Routledge.